30 hours online learning about construction safety might seem like quite the commitment for training in the construction industry, but it’s nothing in comparison to the lives saved and injuries avoided by proper OSHA compliance. The essential OSHA 30 Hour Training Course from OSHA Pros is what you will need if you’re at a supervisor level on many job sites and in at least 7 states. In order to get your valid OSHA wallet card (accepted in all 50 states) signifying that you are a bona fide professional, you must first complete this course. 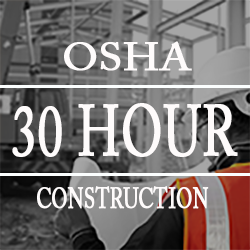 Online OSHA 30 Hour Construction Course – Includes downloadable study guide! Consisting of 25 sections, each between one and two hours in length, the 30 Hour Construction Training Course is fully online, and covers everything you need to know to avoid workplace hazards and stay on-the-ball at all times. These are but some highlights of what you will learn as you work through the 30 Hour Online Construction Course (we also offer a version of this course for General Industry). Each of the 25 sections is concluded with an aptitude quiz, the completion of which is required to move on to the next section. At the finale, you will be presented with a final exam, a passing grade for which must be 70% correct or more. OSHA Pros is the country’s leading compliance trainer, and urges any employers requiring the OSHA 30 Hour Construction Industry training course to use our dedicated program. DISCOUNTED GROUP RATES are available if you have five (5) or more trainees to register. Upon successful completion of the OSHA 30 Hour Construction Course, trainees will be awarded a temporary, printable certificate as proof of their completion, while an official plastic Department of Labor OSHA Wallet card will be mailed to them approximately two weeks later. OSHA Pros knows the importance of compliance, so sign up today for your OSHA 30 Hour Online Construction Course and get a head start on your employment.